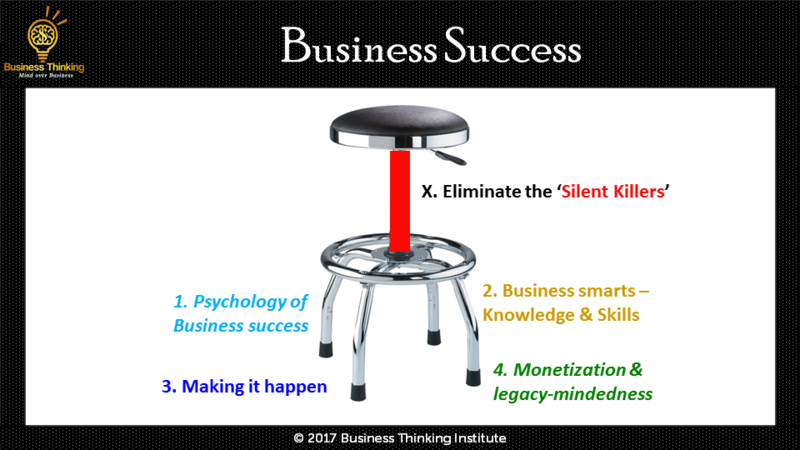 Business success comes from being good at MANY things, not just one thing - the business success factors. As in life, you can only leverage your strengths if your weaknesses are not fatal; and, success or failure starts in your mind long before it manifests in real life. It takes many (or all) factors to be favorable for you to succeed but only one or few to be unfavorable for you to fail. As a result, over 70% of all businesses fail or exit (P.S. If the experts are right, why is the failure rate so high - 70% - and why has it not dropped much over the years?). All of the content on this website is organized around the individual 'business success factors' listed below. If you have a passion for business, you will forever be getting better at one or more of these. What are you good at, and what do you need to work on? Imagine the joy of working on them and the string of successes that you will have. Your Arrogance & Complacency. If you have either of these, success will elude you in business. Success in business and in life is earned every single time you do business - it is not given. Many people fail to succeed or have limited success because they presume success or believe 'it is due to them'. Arrogance could come from what you have - money, power, credentials, looks, relationships and such; and from believing that you are better, smarter, richer or more important than others. Complacency is caring more about where you are (now) rather than about where you are going (future). Complacent people think they have it all 'figured out', losing awareness and curiosity of the world around them - customers, markets and relationships. Complacency is like standing still on a running treadmill. Your beliefs about businesses and being in business is fundamental to your success in business. If you have negative views about business and being in business your subconscious mind will never let you succeed in business. For example, some people believe that businesses plunder society and business people are evil (or some similar belief). Your beliefs and relationship with money will enable or impede your business success. Whatever your objectives for being in business, you need to obtain revenues for the products or services you provide - requires you to charge money for your products or services. And, if you want to make a profit and accumulate wealth, you must be comfortable making and accumulating money. Many people have a financial thermostat (how much money they believe is personally adequate) that is set to a small amount, disabling their ability to generate substantial revenues, profit or wealth. As for beliefs, if you were raised believing that money is the cause of misery in society or that you are not worthy of making (more) money, your mind will ‘hold you back’ when you seek to make money. Your self-confidence is your sense of self. It is your belief in your capabilities to perform at the required level, attain goals, learn new skills and achieve your objectives. It is the most important psychological contributor to performance in the business world because even if have all of the ability in the world to accomplish a goal, if you lack confidence in your abilities, you won't use them to their fullest extent to pursue success. Self-talk drives self-esteem which drives self-confidence. Everybody faces self-doubt. People with higher self-confidence and ability to manage personal self-doubt develop higher self-confidence. Fortunately, confidence is a skill that can be progressively developed with awareness and practice. Your Comfort Zone is your personal zone where you feel safe and comfortable. Most people have difficulty leaving their comfort zones (inertia) or even widening it. Unless you are an accomplished business person (usually experienced), it is highly unlikely that you will succeed without stretching and leaving your comfort zone. Your willingness to periodically leave your comfort zone is a huge factor in your business success. Is your true professional desire and passion - your 'true north' - to succeed in business? Or, would you rather be doing something else - be an engineer, doctor, artist, writer, trader, craftsman, etc.? Desire is a person’s need to possess or achieve something. Think of it as the engine at the front of a train pulling it. If you desire something, you will pursue it with vigor. Obviously, if your desire in business is low, you may quickly lose interest; if it is high, your interest may be sustained for a long time. If you are passionate about business, your interest could last a lifetime. Your Motivations to Succeed in Business - internal and external - are analogous to the engine at the back that provides you the extra push as you move towards your objectives and goals. Intrinsic motivations could be things like seeking prestige, wealth, financial independence or power. Extrinsic motivations could be things like wanting to please somebody, beat a competitor or acquire something. Successphobia. There are several people who have successphobia, a fear of success or have an inability to cross the finish line. The person who fears success has an internal conflict - one part wanting success and the other fearing success. A person who fears success is very much like a person who fears failure – both of them prevent the attainment of their goals. The person is unable to comfortably handle achievement - an underlying fear. Your beliefs are the assumptions and convictions that you hold to be true regarding business, concepts, events, people and things. Instincts are biological impulses that come from our lizard brain – the part of your brain that tells you that you are in danger, fight or flight, etc. at this instant. Goosebumps and breaking into a cold sweat are instinctive reactions to a situation – right at that moment. Your instinctual feelings are at a specific moment in time. Intuition is the ‘sum of what you know and what you don’t know you know’ – conscious and unconscious (unbeknownst to your conscious brain) knowledge. Your brain ‘connects the dots’ in ways you do not know or understand (and may never know or understand). Yet, you can have an intuition about somebody or something. It is your sixth sense. Your business instincts and intuition were developed over your lifetime, based on your experiences, values, rules and stories. You may not act on it but you may have gut instinct or an intuition about something. Your judgment is what you choose to do (or not). Judgement separates successful business leaders from unsuccessful ones – what they 'see', data they want (don't want), analysis they do (don't do), connections they make and choices they make. It is simply the use of your conscious mind combined with your intuition before you act – mind over business. Your mindfulness is about being consciously aware – monitoring your intuitions, emotions and judgments. Over time, you will cultivate discernment - making distinctions and connections between things 'AS THEY ARE', rather than through our 'biased lens'. 40%-80% of decisions people make daily are made on ‘auto pilot’, without conscious thought - some good, some bad. Mindful business leaders are able to 'get to the bottom of things' quickly and make clear-headed decisions. How mindful are you about yourself and your environment? Your personality is a set of individual differences you possess that make you 'uniquely you'. There are several profiling assessments that classify people into different personality types. Your personal 'life story' can provide insights into your values, attitudes, important (according to you) personal memories, social relationships, habits, and skills. Your mindset is an established set of attitudes or way of thinking you have. It could also be described as an inclination or habit. At the extremes, you could have a growth mindset or a closed mindset. Habits are behaviors that we repeat without even thinking about them. They are done for the purpose of performing the action itself. For example, you check your email as your first activity when you get to the office. Old habits are hard to break and new habits are hard to form. Rituals are intentional and focused. They follow a system and could include multiple habits. Their purpose is outside the action itself. You check emails, texts and the customer complaint log every hour to ensure that there are no customer complaints that require attention. When you develop a series of habits in sequence (habit stacking) for a greater reason (not just for the purpose of performing the action itself), that becomes a ritual. For example, you may check emails, check texts and review the customer complaint log periodically at the office; however, if you do them all together for the purpose of serving customers, first thing in the morning, it becomes a ritual. Your Creativity is your ability to think laterally across different aspects of life and business to connect the dots and draw unique inferences and ideas. Warren Buffet spends 80% of his working day reading, thinking and making unique inferences and developing creative ideas - drawing parallels (connecting dots) to develop creative ideas for their business lives. Your Emotional Intelligence is your awareness of your personal triggers and emotions, and those of others to manage. Just as your instincts and judgement were shaped over your lifetime, so too were your emotional reactions. There are emotions like compassion that are ‘positive’ whereas emotions like anger and violence are ‘negative’. Emotionally intelligent people understand themselves well enough to use positive and negative emotions to achieve business outcomes. Are you emotionally self-aware and know how to read the emotions of others to manage yourself and your interaction with others? Do you use your emotional intelligence to achieve greater business success? The combination of critical thinking with intuition enables a person to ‘fill the gaps’ and make inferences with incomplete information to lead to effective decisions. What do you want to achieve and what are your goals along the way? The objectives are aspirational and long-term whereas goals are concrete and short-term. An example objective is that you want to build a business that helps 1 billion people around the world become business thinkers that are able to run their own lives as businesses. A goal is an intermediate short-term milestone that is generally measured easily. In our example, if the goal is to have 10,000 people register on our website this month, I can measure our progress against our goal by counting the number of new registrations on businessthinking.com. Your Business - Market Needs, Your Solutions, Business Model & Business Plan. What is the business you run or launching? What is your understanding (and validation) of the market needs, the solution you offer, your business model & your plan to make it a viable business? Every business is built to meet a need or solve a problem in the market. Understanding the market need (and validating it) is a foundational requirement for any business. Additionally, the solution your business offers (a product, service or a combination) and a clear understanding of your business model - your suppliers, operations, customers, delivery channels and where in the process your business will make money (how much and from whom) are essential for business success. All of these are captured in a business plan which is generally required to successfully run a business. Your business model will represent the various components of your value chain from components, suppliers and partners who will provide parts and services to your team; what your team will do within your company; the various external partners and channels that will enable you to build the product/service you sell, the interaction with your end customer and how you will manage the customer relationship. Your business model will clearly articulate where in the value chain your business will make money (how much and from whom). The business model articulates the rules of the game for creating and capturing economic value in a business. All of these will be captured in your business plan that articulates the market need, strategy, go-to-market plan, marketing, sales, pricing, delivery and support. It will also make projections of sales, revenues, cash flow and profitability for your business. What you know and learn that informs your view of the world, your industry and business? What skills do you have that helps you be successful in your business? Your knowledge of business, industry and specific aspects of your business and markets is essential for your business success. Similarly, you may need specific skills to succeed in your business. Typical sources of knowledge and skills are colleges, universities, training programs, online MOOCs (massive online open courses), conferences, seminars and such. You can also acquire knowledge and skills on-the-job. Your Business Acumen, Business Sense or Business Savvy (used synonymously) is your understanding of how your company makes money and then improving decision-making to achieve better business outcomes. The key drivers of business of business success are cash, profits, assets, growth and people. These five drivers form the foundation of an organization, its products, market position, financing, human resources, and every other aspect of a company. A person with business acument must be able to understand key business data, particularly financial statements such as cashflow, balance sheet and P&L (profit and loss) and how the key drivers in your business relate to each other and work to produce profitable growth and help the business achieve its objectives and goals. Business Savvy or Business Sense is your keenness and quickness in understanding and dealing with a 'business situation' (risks and opportunities) in a manner that is likely to lead to a good business outcome. Do you understand the link between your physiology and your mind, and how to modify your physiology to influence your mind and achieve desired outcomes? Our emotions change based on our posture, hunger, diet and sleep habits. That is physiology at work. In the same vein, have you wondered what drinking a cup of coffee or an energy drink does to your body? Well, you are chemically changing your body chemistry to increase your alertness. There are norms and expectations for each profession and role that one has to understand and conform to. It may be stamina required for a frequent business travelers, ability to work long night hours for those in other professions or it could be that you need to have a certain image for success. Do you know how you need to look, become and play the part for success in your business? Your Personal Brand - Are you building your personal brand and positioning it in a manner that enhances your ability to succeed in your business - for the industry, geography and business you are in? Have you defined your brand identity and do you promote it to the audience you are targeting? This is relevant for business owners as well as those working within a business. Success in business is not a one-person sport. Social skills are about being effective at networking, relating, communicating, building relationships, influencing and leveraging people for business success. Your Resources - Capital, technology, talent, assets, materials, etc. You need people, capital, technology, materials, assets and whatever else you need to make your business a success - the resources required vary by industry and profession. This success factor covers a number of items that are widely covered in the business community - recruiting, retaining and developing the right talent, raising capital for different needs, R&D, innovation, materials required in businesses; and, assets required and acquired for the business. Every business requires marketing to feed the top of the sales funnel, business development to develop the prospects, sales to close them and customer relationship management to retain them. Customer relationship management retains customers and keeps them happy. Businesses without customers are not really businesses and those that cannot hold onto customers die. Smart business people know that the key to building high quality repeatable solutions that can scale in the marketplace come from implementing good processes and systems. A key success factor in business is execution. At the end of the day, money is made when business people smartly take carefully laid plans and resources to ‘make it happen’. If you don't make things happen, there is no value delivery to the client, no money received and therefore no business. Execution is where businesses grow or die, you succeed or fail and money is made or lost. Some people are very good at execution while others get lost in strategizing, thinking, planning, designing, making, marketing and such - losing the opportunity to execute for business success. Many people know but don't do; others do but don't do it well enough; yet others do it well enough but don't persist. Persistence is a key success factor. The world is uneven as so is the world of business. You can choose to complain about the uneven playing field or figure out a way to get the outcomes you want with hustle - the ability to improvise, doing more with less, pushing that extra foot beyond what others will do, doing something that most people think is impossible and staying committed and persistent until you achieve your goal. Every goal needs tracking, measurement, feedback, correction and action to achieve results. Individuals also benefit from having mentors, coaches and people to cheer and hold them accountable for achieving goals and objectives. They also need ‘truth tellers’ who will provide unvarnished feedback when appropriate. Metrics could be leading, real-time or trailing ones and feedback could be from peers, employees, partners and external advisors so you can take corrective action and attain your goals. Any ongoing business needs to generate profits (unless you are a non-profit). Additionally, creating wealth requires you to handle the profits in a manner that becomes your wealth. If you seek to cash out of a business (as owner or employee) by selling your ownership stake, merging or transfering it to the next generation (manage your retirement plan or stock options) you must manage it smartly. A common attribute of successful business people is that they leave a legacy - sharing material things as well as their wisdom and insights for society and future generations. Building your legacy, living your legacy and leaving your legacy. Considering one's business legacy while in the business or when close to retirement or after retirement is a big success factor that focuses people on what is important to them in business. If you are still active in your business, thinking about the legacy you want to leave. It will help you prioritize your business (and often personal) life. Giving back to society and leaving a legacy for future generations could drive a set of behaviors that enhances your success in business - you will be living your legacy. For those of you who have spent a lifetime in business, you may consider the kind of legacy you want to leave. This could be in the form of leaving or assigning material possessions as well as sharing your business experiences, wisdom and insights with the business community and future generations across the world. CLICK TO JOIN the Business Thinking Institute. Become more successful in business. You must love doing business and making money long before you will experience business success.